We could make a meal of just this appetizer! Young baby peas are tender and perfect for this spread. Add some aromatics in the form of onion and garlic, then define the dish with an herbal accent of fresh thyme. This spread is a healthy, low fat, dairy-free option! 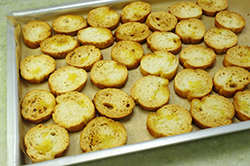 Served on fresh crostini, each bite is a delight. The mélange of flavors reminds of us of France, for no apparent reason other than we always seem to associate fresh thyme with France. Our summer take on this spread substitutes mint for thyme; it’s a toss-up as to which is our favorite! 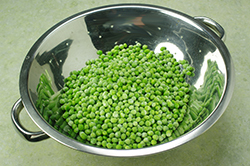 (1) Thaw and drain the baby peas in a colander. Set aside. (2) Finely dice a large onion, sauté in a large sauté pan with the olive oil until translucent and tender about 5-6 minutes. 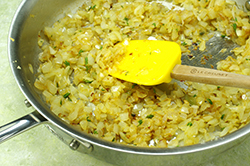 Add the crushed garlic and thyme leaves to the onions in the last minute of cooking. (3) Add the peas, salt, and cayenne to the onions. Add the white wine. Cook until the wine has reduced by half. 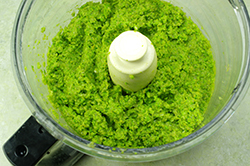 (4) Mash the pea-onion mixture by pulsing in a food processor until a chunky texture is reached. Cool. Stir in the lemon juice and parsley. 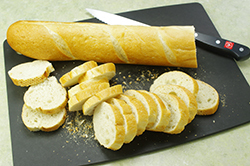 (5) Prepare the crostini by thinly slicing a baguette. Brush both sides of each slice with olive oil. 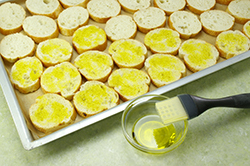 Place the slices on a rimmed baking sheet in a single layer. Sprinkle with a little salt. Bake in a 350°F oven for 7-9 minutes or until the edges begin to turn brown; watch carefully. 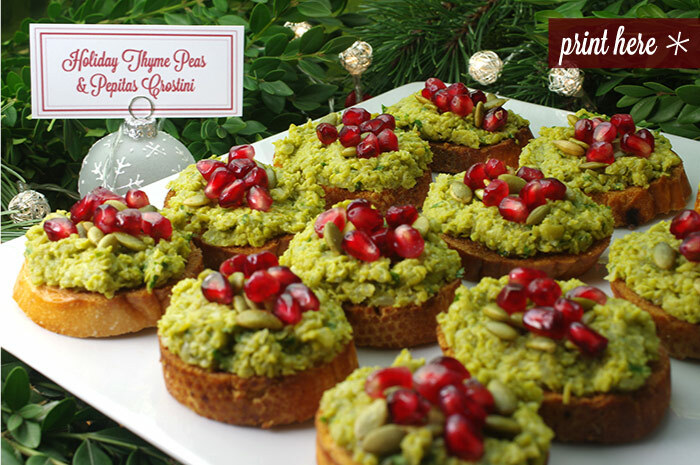 (6) Smear each crostini with the pea mixture, sprinkle a few pepitas on each. Top with a few pomegranate arils. 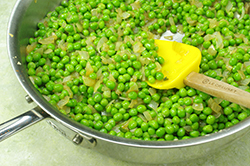 Or, serve the peas as a spread with the crostini on the side. Make the spread up to two days ahead of time. Store in the refrigerator.